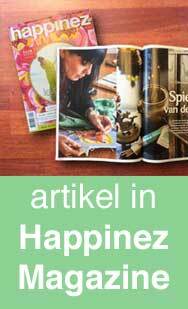 Sweden / Malmö / 3-6 May 2018 / Drawing the Buddha! 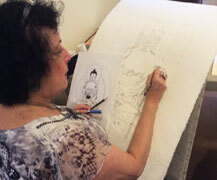 We are very excited to announce the first thangka courses with Carmen Mensink in Malmö, Sweden! 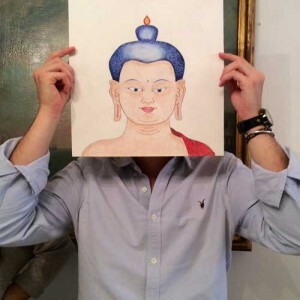 During this evening workshop you will learn how to draw the Face of the Buddha according to the Tibetan Buddhist tradition. 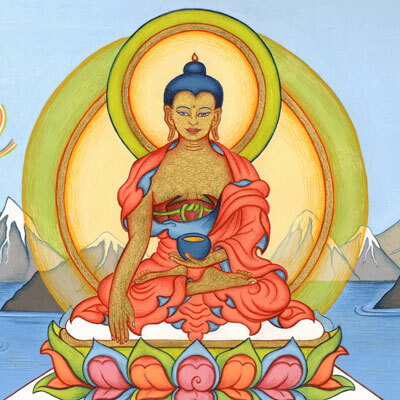 We will start with a short meditation and a short lecture to learn more about the backgrounds and symbolism of Tibetan thangkas, this is the best introduction if you want to learn how to draw a complete Buddha (Buddha Shakyamuni) in this weekend. If you register for the complete weekend course you will get a discount. 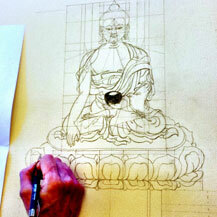 To draw the Buddha Face we will work with the original grid-patterns (that contain the right proportions), which serve as a helpful tool to draw the Buddha (also for people with not much drawing experience). During the drawing session there is a lot of individual guidance by Carmen. At the end of the evening you will return home with a beautiful, self drawn Buddha. Drawing experience is not necessary, enthusiasm is though! 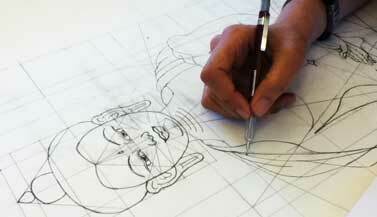 This weekend you will learn to draw The Buddha according to the old Tibetan Thangka tradition. The official name of the Buddha is ‘Buddha Shakyamuni’, and the Buddhist philosophy as we know it in its current form is based on his teachings. Besides the drawing sessions this course offers meditations and lectures about the subject, where you will learn everything about the background and symbolism of the iconography. You will also learn Buddha Shakyamuni’s mantra and its meaning. You don’t need to have any drawing experience, but you need the basis of the Buddha Face workshop on Fri evening 4 May, if you haven’t followed a thangka course with Carmen before (because of the structure and basic principles within the thangka tradition). Sensus is in central Malmö with lots of places around to eat something for lunch. Only 10 minutes walk from Malmö Central Station. You can also take busses 5, 31, 32, 100, 133, 146 or 150 and get out at Malmö Studentgatan. Please note that inside the room we take our shoes off. So please bring a pair of thick socks or slippers as well.